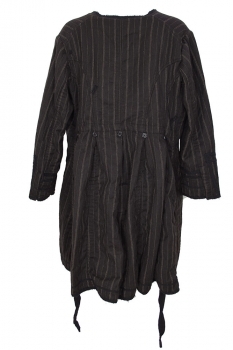 Magnolia Pearl one-size, wool, dark umber, heavy, pinstripe Soren Coat, Netherlands. Black cotton twill lining. Round collar with distressed, black trim. 2 side pockets. Cuffs with elaborate black appliqué, trim and 2 popper fastenings. 5 clip fastenings down front, with decorative buttons and distressed trims. The waist can be pulled in inside using the fabric ties. 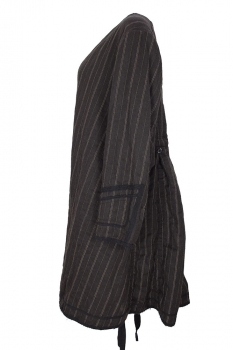 The rear with pleats and button details. A beautiful, unique and stylish coat.